To the Derry City -Strabane Diaspora Newsletter, connect with your community whether you are home or abroad. 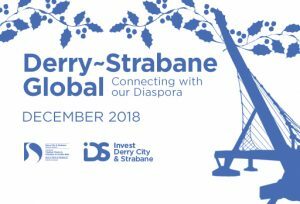 With the aim of connecting with the Derry-Londonderry and Strabane Global Community wherever you may be, the e-zine has interesting articles about what is happening in Derry City and Strabane District, diaspora profiles, our international connections and a snapshot of employment opportunities and employers recruiting in the area. I hope you find the ezine an enjoyable and interesting read. We look forward to hearing from you and encourage you to get in touch! Invest Derry City and Strabane are the official business promotion agency for Derry City and Strabane District Council. Our mission is to tell this city region’s story to an international audience. Our purpose is to promote Derry ~ Londonderry & Strabane internationally, as a premier location in the world in which to invest, work, study and visit and to maintain and develop links with those who have a connection with the city region. We are here to help companies grow and thrive in this location. Supporting Start Up, Growth and Innovative Businesses of all sizes to help fulfil their potential. We provide free, bespoke and confidential packages of advice for foreign and domestics companies and potential investors. We use our unrivalled local knowledge of the region to undertake wide ranging property searches. We can also support your initial recruitment stages to assist with finding core staff, specialists and make relevant recruitment agency introductions for general hiring. We also offer aftercare support to recent investors. Our services are available to national and international companies that wish to relocate to, export from or expand within the Derry City & Strabane District.